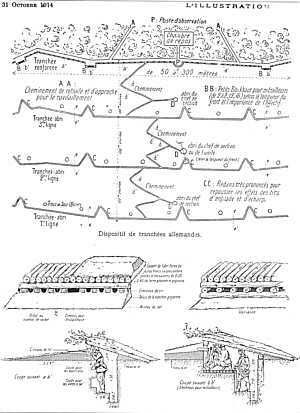 French document describing German trench building techniques. 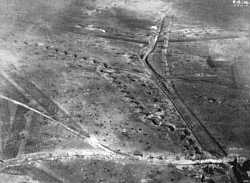 These vast German trenches near Bullecourt are part of the heavily fortified Hindenburg Line. 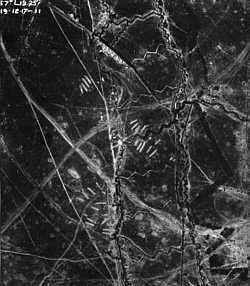 Aerial view of the Cambrai battlefield reveals the intricate system of trenches. The front near Auchy-les-Labassee. No-man's-land is the white, blown out area in the middle. 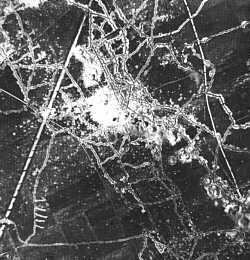 The German trenches are towards the upper right. The less intricate British trenches are on the lower left. 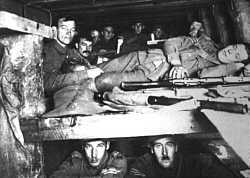 Australians resting up in a dug-out are sheltered from shelling 15 feet underground during the Battle of the Somme, July 1916. 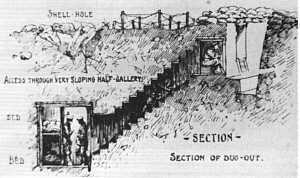 Diagram of a dug-out as being used by the Australians in the photo above. 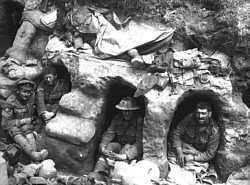 Men of the Border Regiment in scrape holes near Thiepval Wood, July 1916. 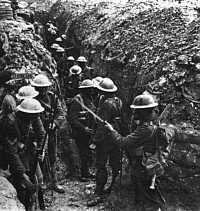 The Lancashire Fusiliers fix bayonets as they prepare to go "over the top" in the Battle of the Somme, July 1916. This captured section of German trench at the Somme helps explain why the initial British artillery barrage did little to weaken the Germans. 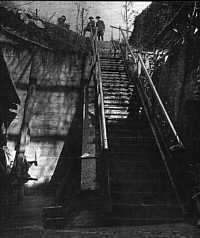 Much deeper than the British trenches, the German trench system offered amenities such as barber shops and officer clubs.